This week, amidst our first Potholepalooza of 2019, I was proud to launch a new workforce training program designed to prepare Washingtonians for careers as street sign installers. The new 12-month earn and learn program, located at the DC Infrastructure Academy, will pay DC residents to train for careers that we know exist in our city. We created the DC Infrastructure Academy to ensure that DC residents can fill DC jobs. As we continue to make big investments in our city's infrastructure, as we do in the budget I just sent to Council, we know we'll need more street sign installers. With this job training program, we can better ensure those positions will be filled by DC residents. As we launched the new program, we also kicked off #GoodSignDC – a new initiative that calls on residents and motorists to help DC Government replace or clarify confusing and broken signs around DC. Residents are encouraged to report signs in need of attention to 311 or by using #GoodSignDC on social media (please include a photo and location). Thank you for working with us to fill potholes, fix signs, and build a stronger DC for all. Mayor Bowser is making big investments in making child care more affordable and more accessible for District families. The Mayor's Fiscal Year 2020 budget includes $52 million to create new child care and early childhood education opportunities at the old Randle Highlands School in Ward 7, the old Miner School in Ward 6, and the old Thurgood Marshall School in Ward 5. 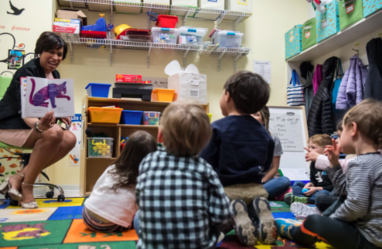 As many families found out this tax season, last year, the Mayor created a new tax credit of up to $1,000 per child for families with children in a licensed DC child care facility. The Mayor's new budget makes this tax credit permanent. Learn more about how the Mayor is investing in District families HERE and HERE. 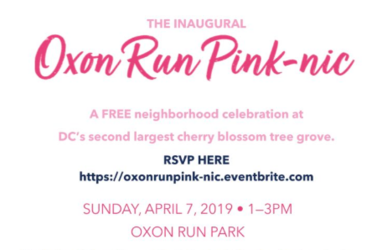 On Sunday, April 7, the Office of the Secretary is partnering with the National Cherry Blossom Festival for the Oxon Run Pink-nic. This family-friendly event, which includes food and entertainment, is part of the annual National Cherry Blossom Festival. The DC Circulator Blossom Bus will transport residents and visitors from the Congress Heights Metro Station to Oxon Run Park. Learn more HERE. Under the Home Rule Act, Washington, DC’s local judges on the DC Superior Court are nominated by the President of the United States, based on the recommendation of the DC Judicial Nomination Commission, and confirmed by the U.S. Senate. With 11 vacancies on the DC Superior Court, the Mayor has been pushing the White House and the Senate to address this growing backlog. These vacancies are a key public safety matter and have prevented the District from making progress on key affordable housing projects. This week, we had a breakthrough: The Senate held a hearing on the nominations of James A. Crowell and Jason Park to serve as associate judges on the DC Superior Court. 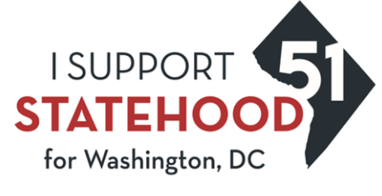 Together, we will continue urging the Senate to consider more nominees to ensure DC's courts are filled and prepared to meet our local public safety needs. This week’s District Minute features stories about the Mayor's child care investments, new housing at the Parks at Walter Reed, and the groundbreaking of Phase 2 of construction at The Wharf. The DC Office of Planning (OP) performs planning for neighborhoods, corridors, districts, historic preservation, public facilities, parks and open spaces, and individual sites. In addition, OP engages in urban design, land use, and historic preservation review. OP has an opening for a Community Planner. 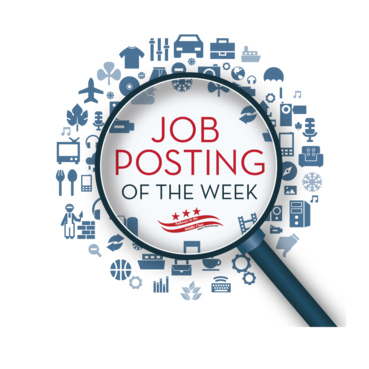 This position is responsible for researching, collecting, and verifying data on demographics, planning, revitalization, and development issues from various sources as well as communicating and presenting major themes and concepts to diverse audiences. All details regarding this vacancy, including qualifications, can be found by visiting the job announcement.